Interested in giving this shirt a place in your wardrobe? If so, you need to know that you're allowed to show the world your cute kitty and your quick tempered wildcat side whenever you want! 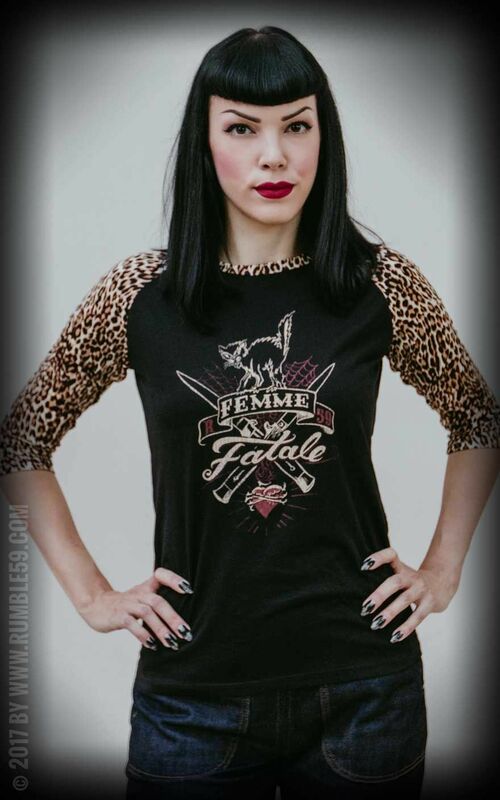 This goes out to all pin-ups, rockabellas and betties: get this must-have shirt that allows you to be sweet tempting at the first place and then change into a wild, dangerous predator. Envious glances promised. Guys, caution - wildlife crossing! 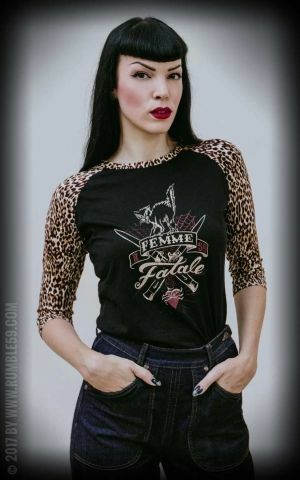 Great raglan shirt with leopatch for coincidently sweet and dangerous pin-ups. This baseball shirt is especially awesome because of its high end material, best manufacturing and printing quality. Framed with leo raglan sleeves and neckline is the front and back held in all black. The printed leopatch is supersoft and therefore provides a perfect wearing comfort. Its big front print isn't only convincing because of the cool design but because of the great vintage print. Are you ready to show your true colors? 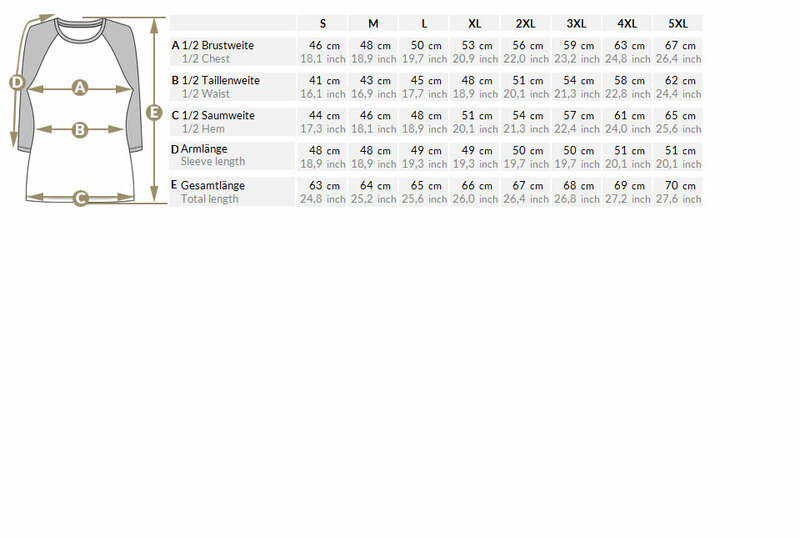 Info: Please check our size chart for the perfect size! 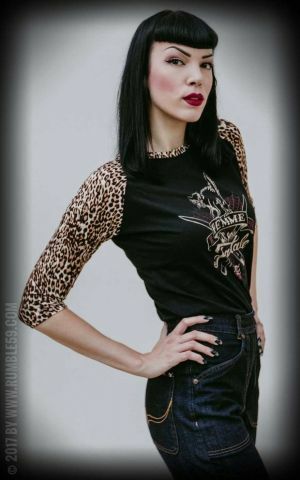 Our beautiful model Tamara Kamikaze wears this shirt in size S.
Rumble59 offers a big range of rockabella fashion! The awesome baseball shirt "Femme Fatale" with leopatch raglan sleeves will definitely become your new favorite item! Ein tolles Shirt! Sehr angenehm zu tragen. Hinkucker sind die Leo-Ärmel.Bei 1,80m und Gr. 38/40 ist M perfekt! Nicht zu kurz, also auch mit Hosen oder Röcken kombinierbar, die nicht auf Taille geschnitten sind. Absolut tolles Oberteil, total verliebt, Größe perfekt, einfach an Größentabelle halten, sehr angenehmer Stoff, superschneller Versand.